Acorn squash has a sweet, earthy flavor that lends itself to many recipes. This versatile ingredient is good for much more than just baking, however. Try these tasty variations. 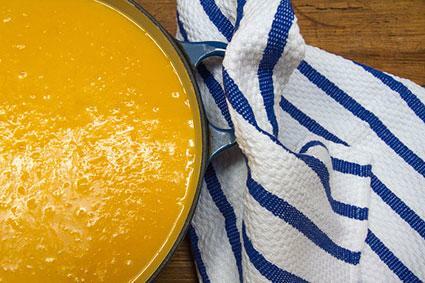 The apples in this recipe add a bit of acidity to the sweet squash while the sage adds a pungent yet tasty character that perfectly works with the sweet earthiness of the squash. In a large pot, heat the olive oil on medium-high until it shimmers. Add the shallot and cook, stirring occasionally, until the shallot is soft, about 5 minutes. Add the squash and apples and cook, stirring occasionally, until they begin to brown slightly, 5 to 7 minutes more. Add the sherry and use the side of the spoon to scrape any browned bits from the bottom of the pan. Add the chicken broth, salt, and pepper. Bring to a simmer and cook, stirring occasionally, until the apples and squash are soft, 10 to 15 minutes. Transfer the mixture to a blender or food processor. Blend on high until smooth, about 1 minute. Return to the pot and stir in the heavy cream. Keep warm while you prepare the brown butter. In a large sauté pan, combine the unsalted butter and the sage leaves. With the temperature on medium-low, allow the butter to melt, swirling the pan occasionally, until it begins to brown, about 5 minutes. Remove the sage leaves from the browned butter. Ladle the soup into bowls. Drizzle the butter over the soup. If you're looking for a non-traditional side for your next burger night, bake up a batch of these acorn squash fries. The spice mixture gives the squash a bit of heat while baking them as fries is an unusual presentation for squash. Serve with chipotle aioli for dipping. In a large bowl, toss together the squash, olive oil, sea salt, black pepper, cayenne, thyme, onion powder, and garlic powder. Spread into a single layer on a large baking sheet. Bake in the preheated oven for 40 minutes or until the fries are browned, flipping halfway through cooking. In a small bowl, whisk together the mayonnaise, lime juice, chipotle powder, and garlic. Serve alongside the fries as a dipping sauce. 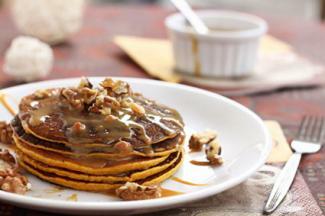 If you've got leftover acorn squash, a great way to use it is for your next morning's breakfast in pancakes. You can also boil and purée squash if you want the pancakes but don't have leftovers. In a medium bowl, whisk together the flour, sugar, baking powder, cinnamon, nutmeg, salt, ginger, and cloves. In another bowl, whisk together the milk, puréed squash, melted butter, and egg. Add the wet ingredients to the dry ingredients, folding until just combined. Heat a nonstick griddle or skillet on medium-high. Spray with nonstick cooking spray. Working in 1/4 cup batches, pour the batter onto the griddle. Cook until bubbles form on the top, 2 to 4 minutes. Flip the pancakes and cook on the other side, another 2 to 4 minutes. Transfer the pancakes to an oven-safe plate and put them in the preheated oven to keep warm while you prepare the sauce. In a medium pot, melt the unsalted butter. Stir in the brown sugar. Cook, stirring constantly, until the sugar dissolves and the mixture begins to boil, 4 to 5 minutes. Whisk in the heavy cream. Simmer, stirring constantly, for about 5 minutes or until thick. Cool slightly and stir in the pecans. Serve the topping spooned over the pancakes. With its sweet, earthy flavors, acorn squash is a very versatile vegetable. 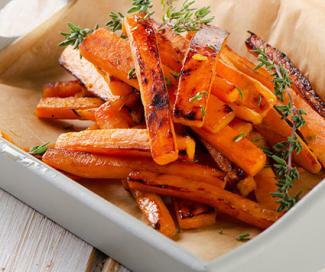 You can use it in both sweet and savory recipes to add a delicious element to your cooking.